Brooklyn native John Cadelaria had a great 19-year Major League career. Noted for a three-quarters left-handed delivery and throwing a high-90's fastball with pinpoint control, he displayed phenomenal movement that left batters sprawling. Candelaria was also outspoken, once calling his GM in Pittsburgh a 'Bozo," and vocally expressing a passion for living large by saying "life is a mystery to be lived, not a problem to be solved." 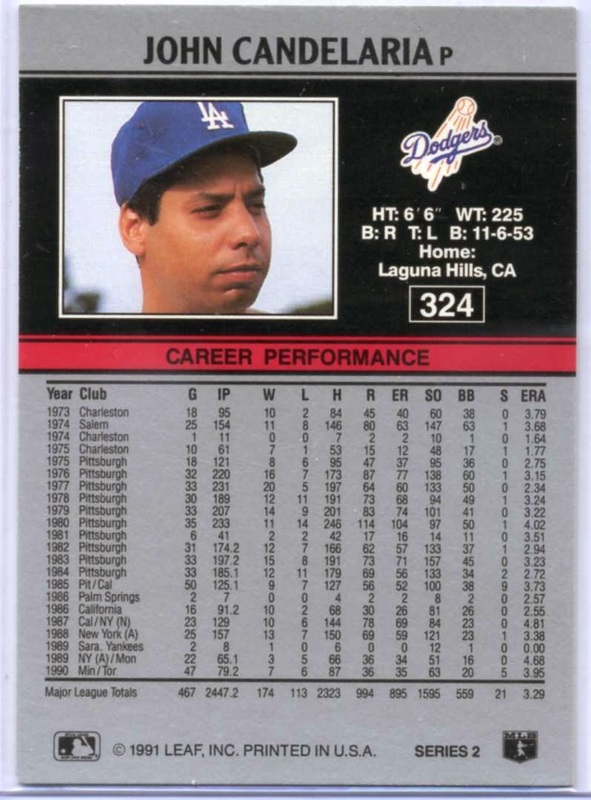 Overall, Cadelaria played for nine different clubs; including the Dodgers from 1991 to 1992. Over his career he appeared in one All-Star game in 1977, won a World Series trophy with the Pirates in 1979 and was the American League Comback Player of the Year in 1986. He also threw a no-hitter against the Dodgers in 1976; which was the first Pirate no-no thrown in Pittsburgh. At the age of 15, Candelaria attended a baseball tryout where a Los Angeles Dodgers scout called him the best he had ever seen. The tryout catcher had to be replaced with a major league catcher for fear of injuring the stand-in. By the account of this same scout, Candelaria was in line to sign with the Dodgers before he appeared at a later tryout wearing a shirt that featured a marijuana leaf with the caption "try some, you'll like it." The Dodger executives at the tryout were so appalled by this lighthearted display that they declined to sign him. Strange, right? But, considering we're talking about the Candy Man it's not so out-of-bounds. After all, this was a guy who could party harder than most, while still hurling wicked fastballs on the corner. Although he was not given a contract until the end of camp, he made his lasting impression during one of the first intrasquad games. He threw a fastball that hit teammate Juan Samuel in the elbow, then later confessed to his astonished teammates that he had done it purposely. "The guy hit a home run against me six years ago. . . . And pay-back can be brutal," Candelaria said. By the time he became a Dodger he was in the twilight of his career. He got into more than 50 games each season with the Dodgers and was used primarily as a left-handed specialist by the team. By all accounts he was very effective; still able to fling a fastball like a trebuchet aimed at a mighty castle. As the oldest member of the Dodger club in 1991 and 1992, Cadelaria still had something to give as he searched for one final chance for a ring. 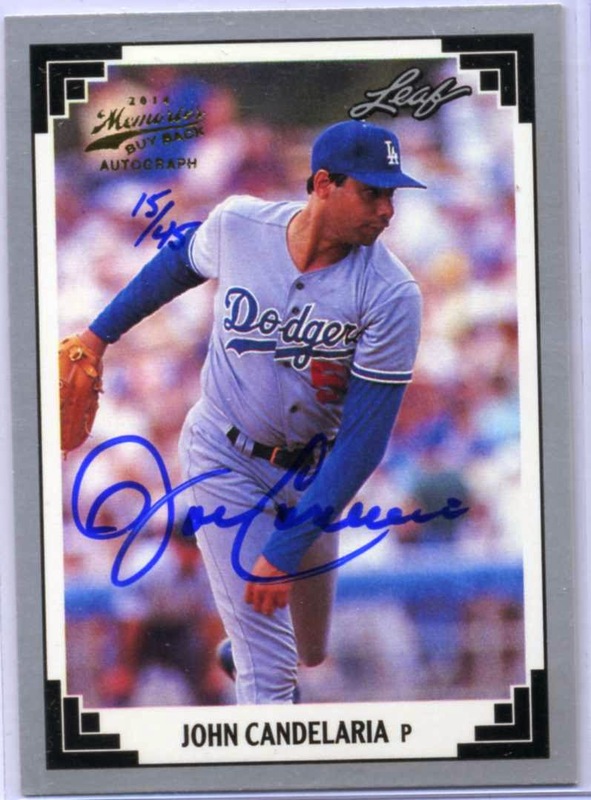 Featured in this post is an autographed 1991 Leaf John Cadeleria card that I added to my collection. It is a 2014 Leaf Metal Draft 'Leaf Memories' buyback autograph card, and has been numbered 15 out of 45.